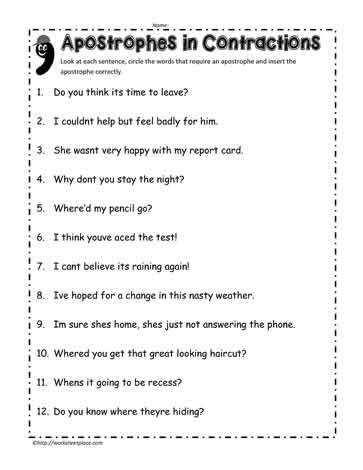 Examples of apostrophes used in contractions. Apostrophe worksheets and apostrophe printables. Do you think it?s time to leave? I couldn?t help but feel badly for him. She wasn?t very happy with my report card. Why don?t you stay the night? I think you?ve aced the test! I can?t believe it?s raining again! I?ve hoped for a change in this nasty weather. I?m sure she?s home, she?s just not answering the phone. Where?d you get that great looking haircut? When?s it going to be recess? Do you know where they?re hiding?